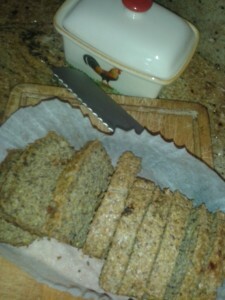 Flax seeds grind down to a flour to make a delicious nutty-tasting bread. This quick and easy recipe makes a small loaf of eight to ten slices. You don’t need much as the protein and good fats keep you fuller for longer. Butter a slice or two and eat with a boiled egg for breakfast or soup for lunch. Remove the loaf from the oven and leave to cool on a wire rack. If not using immediately, slice and freeze for future use.